Rich Rodriguez will be bringing with him his practice of making football alumni honorary captains for every game. His first group at Michigan will include three men who, between them, have four All-America selections, a retired jersey, a spot in the NFL Hall of Fame, two in the College Football Hall of Fame, two NFL titles, and a citation by Lil' Wayne. Dierdorf is almost certainly the most familiar of the three to Michigan fans. A 1970 All-American, Dierdorf was a freshman during Bump Elliott's last season as head coach. As freshmen were ineligible to play at the time, Dierdorf's first season on the field coincided with Bo's first on the sidelines. After being selected by St. Louis in the second round of the 1971 NFL draft, Dierdorf went on to play 13 seasons with the Cardinals, most of it spent at right tackle. A six-time All-Pro, Dierdorf became a member of the NFL Hall of Fame in 1996 and the College Football Hall of Fame in 2000. Immediately after his retirement from the NFL, Dierdorf began calling games, spending 12 seasons on ABC and 11 at CBS in two different stints. In 2008, Dierdorf has recently received the Pete Rozelle Radio-Television Award, recognizing "long-time exceptional contributions to radio and television in professional football." Dierdorf is also referenced by Lil' Wayne in the remix of "Chain Hang Low" (viz. : "my diamonds big like Dan Dierdorf"). Ron Kramer is one of the most exceptional athletes ever to play for Michigan. Like Dierdorf, he played in a time when freshmen were ineligible, yet he's a nine-time letterman in track & field, football, and basketball. All three years he was named MCP of the basketball team, and at least once he left spring football practice to win the high jump with a leap of 6'4". Not bad for a 6'3" guy who weighed 230. Kramer was constantly on the football field, playing "offensive and defensive end, running back, quarterback, kicker, and receiver, often all in the same game," according to the Bentley Historical Library. His career punting average was 43 yards, and he kicked 43 extra points and a pair of field goals. As an end, he caught 53 passes for 880 yards, but Bennie Oosterbaan prized his blocking and tackling most of all. An All-American in 1955 and 1956, Kramer's number 87 was retired after his senior year. Following his Michigan career, Kramer went on to play for Vince Lombardi's Green Bay Packers as a tight end for seven seasons, interrupted by a year in the Air Force in 1958, and three with the Lions. Kramer won NFL titles with the Packers in '61 and '62. In SI's "50 Greatest Sports Figures From Michigan" in 1999, Kramer was ranked #7 (behind such luminaries as Joe Louis, Magic Johnson, Charlie Gehringer, Bennie Oosterbaan, Hal Newhouser, and Dave DeBusschere). Today, Kramer is known to players and band members as the man who supplies them all with apples. Chappuis (often misspelled as "Chappius", as that's how he pronounces it) began his Michigan career with the 1942 football season, appearing in nine games as a halfback, before wartime service interrupted his career. As a member of the US Army Air Force, Chappuis served as a radio operator/aerial gunner on B-25 Mitchell bombers flying in the European theater. On his 21st mission, Chappuis's B-25 was knocked out by flak on a bombing run against a train tunnel north of the Po River in Italy. After kicking the stuck tailgunner free, Chappuis parachuted into enemy territory. Italian partisans managed to collect Chappuis and two of his crewmates before the Germans. For three months, the Americans were shuttled between houses and villages, winding up in Mantua when the war ended. After his discharge from the military, Chappuis returned to campus in 1946, joined the baseball team as an outfielder, and led them in batting on their way to a 26-game winning streak and a Big Nine title. On the gridiron, he proceeded to break Otto Graham's Big Nine record for total offensive yards while playing with a broken wrist the whole season (in which he threw for 734 yards and rushed for 501). In the 1947 season, coming off surgery to repair the wrist, he broke his own mark with 976 yards through the air and 544 on the ground as one of Fritz Crisler's "Mad Magicians". Against Ohio State, Chappuis set a single-game school record for offensive output with 217 passing yards and 90 rushing, routing the Buckeyes 21-0. The 1947 Wolverines were the first to employ Crisler's innovative strategy of fielding separate offensive and defensive units, and Chappuis landed on the cover of Time as "The Specialist", due to his status as a prolific passer for the era. He finished his career at Michigan by being named Rose Bowl MVP in a 49-0 stomping of USC. It was such a resounding thumping that the AP called an unprecedented post-bowl poll to reassess which team was better, undefeated Michigan or undefeated Notre Dame. Michigan won the final poll by almost a 2:1 margin, but both schools claim the title. i.e. the way Michigan fans have sort of taken this off season of crazy changes and expectations in stride. There's fear, but smiling suppresses the gag reflex. Football Saturday is Football Saturday, and we should never think otherwise. To quote 2007 Geoff: "I am gonna make it through this year if it kills me ." When pressed, even the Michigan haters are saying 7-5 or 8-4. Michigan fans would LOVE to be that confident. No Jake Long means no off-tackle left for the first play of the season. If he wins, and wins with class and honor; the differences between Coach Carr and Coach Rod will quickly be forgotten. We can only hope. The Blog That Yost Built has the scoop on the new hockey band seats, although the link to the USCHO thread is broken as of this writing. The band has been tucked between sections 22 and 1 since 2002. Before that, they were in the upper half of section 20. Section 19 is next to (some of) the students. Increasing the band by 30 and dropping them under the upper deck will have interesting acoustical effects. It could be raucously loud, or it could just be confusing and noisy. Either way, the addition of 30 students is a welcome change, sure to make an already intimidating venue considerably more so. And while it's assumed that the new director will not be allowed to dance, he will be more easily able to hear the students' polite requests for him to do so should the right circumstances arise. Jeremy: And the impressively oversized stadium renovation, with its sky-high unfinished scaffolding dragging us slowly into modern times, is the world's largest metaphor. At least since the Titanic... though that didn't turn out so well. Geoff: But the music was excellent. Jeremy: Is that a segue? Geoff: It's as good as we can get. Craig: I think a lot of our readers are curious to know what we know about the "Victors Walk", which has been previewed during the last few days. Geoff: The video posted on MGoBlue.com just raised further questions. Jeremy: To bring people up to speed, according to Doug Karsch, apparently the team's trip into the tunnel is going to be met by the Michigan Marching Band. Geoff: And this is supposed to happen two hours before game time. The Victors Walk seems to pose a number of practical obstacles for the MMB. Jeremy: As loyal reader Aram pointed out, in order for the MMB to be there for this, they'd have to leave the morning rehearsal early and have approximately zero time to eat or change into uniform. Geoff: Things get easier with a late game, but still, what are you going to do for those noon kickoffs? Are you going to start practice at 7:00 AM? If you start later, will it just be a full-uniform practice? Are you going to march back to Revelli after the Victors Walk is over or stay in the stadium for an extra hour? Is it even going to be the full block, or just Fanfare Band? In the Karsch clip, I count about 40 band members in the stands, but that might not mean anything when it comes to the actual game day. If it's just Fanfare Band, you still have to get those members off of Elbel, into uniform, and down to wherever they want them on the Walk. Jeremy: But even that is cruel and unusual treatment for Fanfare Band; even getting pampered with a catered lunch doesn't really make up for that precious down time in the morning before game time. Geoff: No, it does not. Geoff: If it's Fanfare Band, I'm sure that they're walking back to Revelli Hall after playing. Otherwise you have a whole different set of difficulties with the usual parade and loading the tunnel. Jeremy: so they have to walk to and from the stadium in full uniform twice? Geoff: It's the easiest solution I can think of. Other than pulling reserves to fill in the gaps in the ranks and then switching them out inside the tunnel after having Fanfare Band wait in there for an extra hour/hour and a half. Jeremy: We will find out in a few short days. And if anyone reading this knows, please fill us in. Geoff: Our first show of the year sounds like it'll be a strong one. We'll be saluting The Who. Craig: Which has me very excited. Geoff: "Pinball Wizard" is an MMB classic from the days of "A Saturday Tradition"
Craig: That's a lot of songs people will know/like and seems like it should be well received by student and alum alike. Jeremy: I believe Pinball Wizard is a new Boerma arrangement. Geoff: Oh yeah? That'll be interesting to compare. Jeremy: Also, Baba O'Riley is a notable omission. Craig: Well, it doesn't help that most people don't know the song's actual name. They'll just complain that "Teenage Wasteland" is missing. Geoff: "I Can See For Miles" would've worked better if Les hadn't stayed down at LSU. Craig: Is it our way of sending Les some love as the Bayou Bengals open with they from Boone? Geoff: Actually, if they follow it up with "Won't Get Fooled Again", maybe they're sending a different message. Craig: "Meet the new boss....same as the old boss.."
Craig: "I tip my hat to the new constitution, take a bow to the new revolution, smile and grin at the change all around me..."
Jeremy: I'm torn who to cheer for in that game. Les Miles to rain hellfire on someone we couldn't beat like he did with OSU? ASU so that our loss is no longer the biggest upset of all time in the eyes of the media (even though Stanford beating USC last year is the true champion)? A meteor? If it were 2007, I'd probably just throw up at the athletic prowess on display. Craig: Jeremy, I have struggled with the same question and I have realized that there is no correct answer, just get back from the Michigan game as quickly you can to a television with ESPN and settle in. And failing that, Ron Franklin is calling MSU/Cal. Geoff: Does anyone really know what to expect for Game 1 of the Rodriguez Era? I mean, last time we had no idea who would be the starting quarterback, we at least *thought* we knew. Jeremy: No! And that's the beauty of it! Craig: No. Not even Coach Rod, I would suspect. There are not only too many variables, but there are too many variables within the variables. Jeremy: for once, I have -no clue- what the opening drive will look like. Geoff: I know! I checked on UFR. The last three years, it was a Hart rush. The last two, a run to the left. And 2005 wasn't charted for where he ran. Craig: He might punt on first down. It's what our last coach from West Virginia LOVED to do. It's like Crazy Ivans....TO THE STARBOARD! Geoff: Apollo XIII is on AMC right now, and they're right at the single greatest engineering scene ever depicted on film, and you hope that Rich Rod's coaching staff took that same look at the available parts he has from which to create a whirling death ninja offense. Jeremy: So will RichRod as Gene Kranz turn to his engineers (offensive coordinators) who say their ship (team) wasn't designed to do that (run this play), and then damn well do it anyway? Jeremy: I hope the team doesn't find itself in a similar potentially-the-biggest-disaster-in-program-history situation as the Apollo 13 crew did, though. Craig: Agreed. I hear 8 wins from pundits and think "Wow, that's bold!" Geoff: Wisconsin, Penn State, and OSU will be tough, tough wins. Illinois, MSU, and Utah could take 2 out of 3 and I wouldn't be surprised. Jeremy: Even guessing at records (7-5 is fine with me), there's no way to predict which five we'd lose to or seven we'd beat. Craig: Indeed. I would love to think it's Penn State, because I have the shirt ready to go...which likely means it will fail miserably. Craig: Yes. I have an idea for a shirt should Michigan extend the streak. Geoff: Yeah. Only a few days left, but we still have to wait. Jeremy: Baseless conjecture is fun but we've been doing that for almost a year. Craig: Indeed...Also, a request to our readers: You guys and gals are awesome. You have given us great tips in the past, and great ideas. We're always willing to listen. Share, participate, give us what you have. We appreciate it and will continue to do so. Craig: Until next week, Go Blue, Get There Early, and let a new day dawn. Jeremy: And to end with another Apollo 13 quote... we'll catch you on the flipside. Jeremy: "We just put Sir Isaac Newton in the driver's seat" is hopefully appropriate as well. Last night, I popped over to MGoBlog to check MGo.licio.us and saw this article from J. Brady McCollough (as Brian noted, a Michigan Daily alum) of the Kansas City Star and was struck by a quote, which I filed away to write up when I got home from work today. Then I woke up and read this post, and I quickly realized my post was not only unnecessary, but also would have paled in comparison. Brian nails it, down to the quote that caught my eye and my general feelings on the topic. Anything I could add would feel superfluous. Michigan, as a fan base, is exceptionally fortunate to have Brian. He embodies so much of what we, as Michigan fans, value and appreciate. It's a wonderful place to start, but it isn't the only place to go. So as another season starts, go and look at what the Michigan blogs have to offer. Frequent the ones you appreciate, and make your voice heard when appropriate. It's unlikely you will be told down in front. And if you can't find what you're looking for, cook up your own. Find an angle, find your voice, and even if you're not very good when you start, keep trying. I like to think I have gained some wisdom over my 29 years and 11 months on this planet. I've learned a few things. Some I have learned the hard way, some from watching the mistakes of others, and many from looking to history for guidance and made a best guess. Usually by this point in August, there's been a "heart/head" dialoge where I try to sort out what the fan in me wants as opposed to what my reading of the tea leaves suggests will happen. But last year changed everything, and then some. Oregon, the "Fell on Black Days' game, proved that you can't just make things better just because you want them to be better. The Notre Dame game proved that no matter how bad things are, there's always someone out there very much like you who has it worse. Penn State proved that the more things change, the more things stay the same...Sadly, so did Ohio State. The bowl game proved that the future is a tricky thing, but letting the history end on its own terms is a trickier one. So here we are, ten days before Michigan plays Utah. New coach, new offense, new stadium construction, new apparel manufacturer, new jerseys, new era...and yet, same helmets, same fight song, same banner, same Scandinavian fans more concerned about not losing than the joy of winning. What wins out, the past or the future? The future, it always does. The great thing about the future though, as John Kennedy, is that history is like a tide that relentlessly moves forward in which we can either hold fast or be carried away. Standing up for that which made Michigan football great before is the best way to work to insure that it will be in the future. But, it must not also be hidebound to tradition. And so here we are...and I have no idea. My heart says 9-4 just to prove the haters wrong, my head says 7-6 or, gulp, 6-7, because there are too many variables. But in the end, I think it's 8-5 with a loss in the Alamo Bowl. And I won't even say that I hope I'm wrong. Because honestly, if I am, I think it's going to be much worse than that. But the thing is, I don't know anything, but I know I don't know anything. For once, I am comfortable with that. Today is the day that signals we're truly in the home stretch before football season – the first day of Band Week. The new freshman reported today to start working with the rank leaders, section leaders, returning Drum Major Cody Martin, and Professor Boerma. In addition to signing out their instruments, they were out on the blacktop at Elbel Field for a pair of two-hour rehearsals. Congratulations to those who survived, and good luck with the rest of your week. We refer you back to our Guide For Incoming Freshmen, including the comments. Good luck to all of you this week; you're going to enjoy it all through the exhaustion. These people will be your constant companions for at least the next semester, and you're bound to make some of your best friends throughout your college experience. Someone you meet this week? Yeah, you're probably going to be in their wedding. 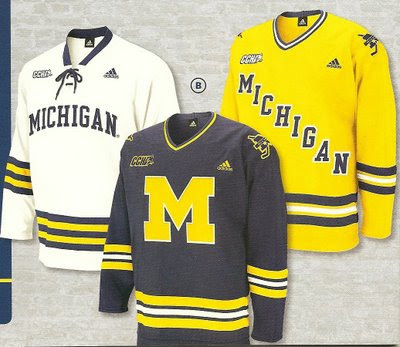 Interestingly, this inverts recent tradition of having the Block M on the home white jersey and the arched Michigan on the blue road. The white looks like there is room to put a front number under the lettering. (Also, is it just me or is that a huge registered trademark symbol there?) 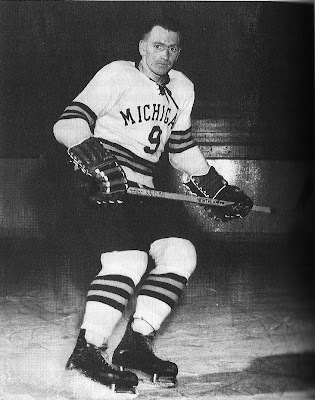 The striping on this jersey does not match the other two, but also gives it the look of an older Michigan jersey, 1960s vintage, as we can see in following photo of Red from page 156 of Blue Ice (credited to the Bentley Historical Library). The navy road jersey looks nice, the white middle stripe seeming to be a little thinner than on their Nike predecessor. 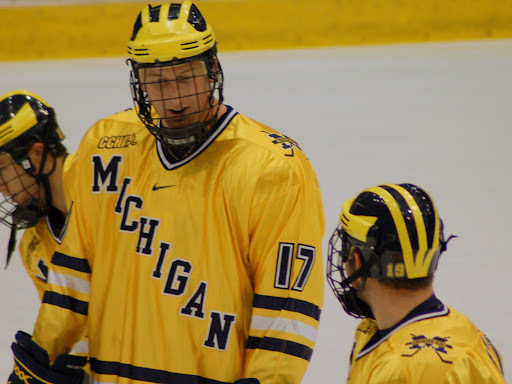 The maize third looks relatively unchanged, (see photo of returning senior defenseman and captain to be Mark Mitera below) save the fact that of the authentic vs. replicas last year, the maize was the most distinctly different . A few things we don't know yet, such as what font the names and numbers will be in as yet (last year using the Bears' number font and the Red Wings' lettering font) nor if the players will be wearing the "Dazzle Fabric" as they have the past few years. 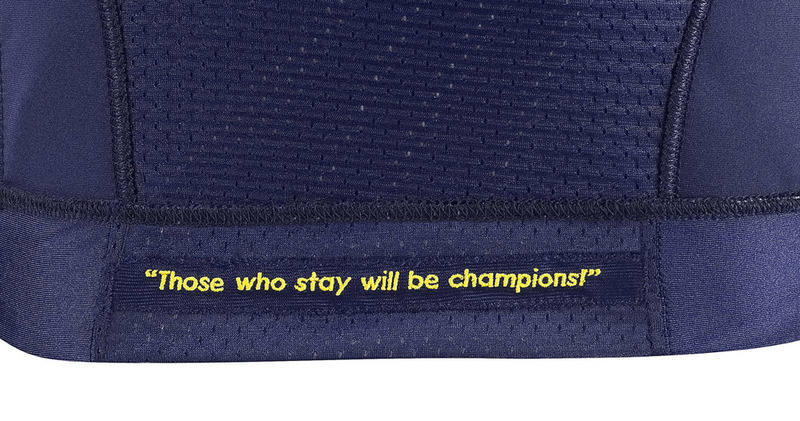 We also do not know if adidas will be embossing the years of Michigan's nine NCAA titles on the inside shoulder and stitching a patch that says "Watch For Flying Pucks" into the interior hem. All of this will come in due time. All in all, no worries, it looks nice. 1). Coach Rod's lapel pin is, easily, the biggest of the 11 coaches. The Block M just pops. His chin rub does give the feel of "What is it going to take to get you into this Ford Flex today?" 2). Mark Dantonio gets slot three (Just after Sweater Vest and Wizard Hat, but ahead of ZOOK and JoePa). In his second shot, he proceeds to scare the hell out of me. The way he says "We've got a great program here" is half-Marine Corps recruiter, half Daily Affirmation. You just know that John L. would have slapped himself, the kid, the camera man, and the plate of brownies. Meanwhile, Coach Carr would have just lulled the kid with his laconic Tennessee-born charm and told him he was "tremendous". 3). ZOOK is very low key in the ad, but just wait until they talk about water skiing. That or it's just a patented Zook mind trick for, to show the real thing on television would be considered an unfair advantage for the Illini. 4). Pat Fitzgerald feels a little bit like a Northwestern version of Herbie. It's just a purple Herbie vibe. 5). Suits 10, Polo Shirts 1. I know it's your last season Mr. Tiller, but come on, you've gotta dress the part. 6). Coach Rod, so confident in the fact that "You know, we're the winningest program in history" he can snag one of the brownies off the table while saying it. 7). I love JoePa. I mean, he clearly is like your great uncle who was way more fun than your grandpa and always had better stories and you were just bummed that you only got to see him once a year at the family reunion. 8). Effective communication tip #98: When pointing out that your school's offensive philosophy will be changing to the spread, make sure you gesture appropriately with your hands to sell it. 9). Joe Tiller: "We're the cradle of quarterbacks!" Sure, but just don't mention that Kyle Orton went there. 10). Oh who is that guy who replaced Hep? Come on....Come on,,,,Bill Lynch! That's his name. Sorry about that IU. 11). Kirk Ferentz, man who clearly does not want to be there. 12). I like Fitzgerald's "I thought you told me you want to be the best" switcheroo motivational technique. Don't sell, challenge the kid to prove himself to you with you providing the tools to do it. 13). Zook: "You like Roses?" The answer to that is yes, which is way more than most Illini can probably say at the moment. 14). Coach Rod: "Look, our helmet's got wings!" I just get the feeling Coach Rod doesn't know what to do with himself. After all those years of trying to sell living in Morgantown and selling West Virginia as an up and coming program, he now gets to sell Michigan. It's like selling the iPhone, the hype is built in, you just need to make sure the customers stay happy and the press stays positive. 14a). As Awful Announcing correctly posits, you just know that Coach Rod uses that exact line as a selling point, and that it is a major selling point. 15). "Come to Penn STATE!" Through gritted teeth, JoePa closes the deal! He's also getting very close to where you need a subtitles for him. 16). Your face time winners: Perhaps not surprisingly, it's "master recruiters" ZOOK! and Coach Rod, who each make five appearances. Least seen coach? Surprisingly, Coach Tressel makes just three appearances in the whole ad, but he does lead things off. Tiller and Ferentz also check in at three. Given the brevity of his shots, I think we have to go with Coach Ferentz here. "I'm going to be somewhere in that stadium. I don't know exactly where," Carr said. "But I'm looking forward to listening to the band, and I'll be interested to watch the student section. You know, those kids raise a lot of cane [sic] down there in that north end. I'm going to enjoy all the pageantry, as well as watching this team play." My one hope for the season is that, at some point, Professor Boerma Rickrolls the crowd.